Sensor housings are constructed of PEEK, a high performance thermoplastic that provides outstanding mechanical strength and chemical resistance. Multiple sealing materials are used to preserve sensor integrity over a wide range of applications. A large volume, dual junction saltbridge is used to maximize the in-service time of the sensor. The annular junction provides a large surface area to minimize the chance of fouling. Large electrolyte volume and dual reference junction minimizes contamination of the reference solution. The replaceable saltbridge allows for easy sensor regeneration. The reference element of this sensor is a second pH electrode immersed in a reference buffer solution. This glass reference system allows the sensor to be used in applications that poison conventional pH sensors. An integral preamplifier is encapsulated in the body of the sensor. This creates a low impedance signal output which ensures stable readings in harsh environments, and maximize the distance between sensor and transmitter. Sensor diagnostics are used to alarm the user in the event of electrode breakage, loss of sensor seal integrity, or integral temperature sensor failure. Sensor electrodes can be user-specified to ensure measurement reliability and maximum sensor lifetime. The type of glass used in the pH electrode can be selected for optimal performance. The metal electrode used for ORP measurements can be platinum or gold, depending on chemical makeup of the process solution. Four-button programming provides intuitive navigation through the menu driven user interface. 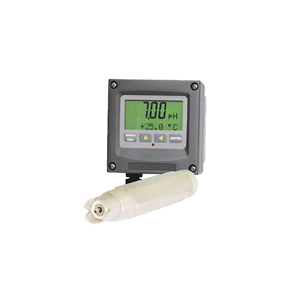 The 4 to 20 mA transmitter output can be configured to represent any portion of the measurement range. Output HOLD, ALARM and SIMULATION features provide the user with complete control of the system output under any condition. The flexible two-point and sample calibration options include auto-buffer recognition from thirteen built-in buffer tables. Manual override of the automatic buffer values allows the user to customize calibration values. To ensure high accuracy, all calibration methods include stability monitors that check temperature and main parameter stability before accepting data.